An innovative product on show at the Propak Africa expo in March was Polystar’s bulk baler bags, offered as a viable alternative to wooden pallets. The traditional wooden pallet has long been a trusted ally of supply chain and warehousing staff, but goods loaded on pallets often require pallet wrap to stabilise them and to retain their shape in transit. Sometimes strapping, adhesive additives, caps, angle boards and layer pads are included to counter the rigours of distribution. Polystar Tape & Fabric boasts state-of-the-art extrusion and weaving equipment and in-house testing facilities to ensure cloth and bags conform to the stringent quality and safety standards required by law to ensure safe handling of bulk materials. The latest development showcased at Propak was the clear woven bulk baler bags developed to reduce the need for pallets and additional wrapping of product packed in small bags. They can be packed manually or by robot; and loading is via the top cross corner loops, with a top cover flap with attached buckled straps to keep the product enclosed. Printing is offered if required although the clear woven material allows for visibility of the bags inside. After being used for transportation to warehouses, retailers and distribution centres, the compact and lightweight empty bags can be returned for reuse. And Polystar’s innovation doesn’t stop there. An exciting development is a ‘conductive bag’ that features carbon tapes woven into the material for connection to an earthed lug to ensure the removal of static electricity when packing and transporting combustible products. 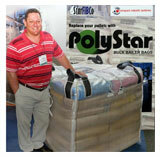 Caption for pic: Francois Terblanche (PPBags, marketing agent for Polystar) shows off 50kg bulk baler bags at Propak Africa.